Up on Carpenter Ridge, new route activity is ongoing. Ben Clark and I established a new route to the east of the Paradise Wall-on the Bonanza Wall. 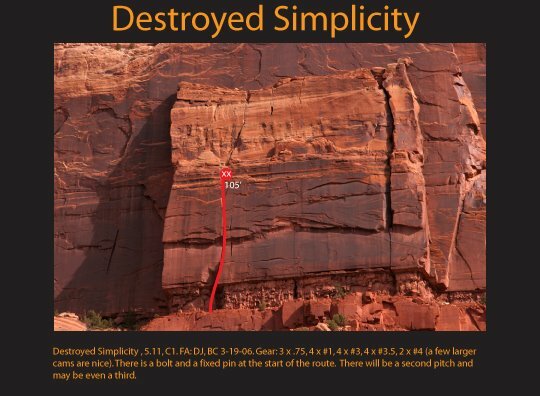 We called it Destroyed Simplicity, 5.11, C1. The C1 will go free once the route sees a bit more cleaning. 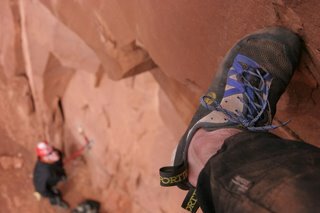 There is at least one additional pitch to add to this route, as well as a fun looking (but wide) two pitch route to the east of our route. At the moment, all roads to this area are over private property. There where no "NO Truspassing" sings on the way Ben and I used to make the approach drive. To date there are only a few routes in this area (as of March 18, 2006). 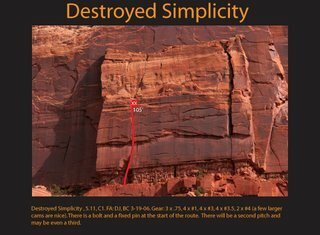 Also, Charlie Fowler and Chris Boskoff were busy putting the finishing touches on beautiful new route they called The Badger State, 5.11. To read more about their adventure Click-Here.